Are you ready hockey fans? After a lockout that lasted 113 days, it is officially time to say GAME ON!!!!!!!!!!!!!! Can you feel the energy around the league? Every where I look the team colors are taking over the city. The media and fans whispers get louder with each game that occurs and each goal scored. Has your team played yet? Can you hear all the things people are saying following opening day? Did you watch Coaches Corner? Did you see Don Cherry call Ron McLean’s nightly theory stupid? Did you see many rivalries re-ignited? Did you see any of the highlights or perhaps watch a game or two? I must admit, I missed hockey and may or may not have watched more than one game yesterday. Hockey is back and the possibilities are endless. I cannot wait to see what happens as the season unfolds. Was opening day everything you hoped it would be? If you are Canucks fan, the answer will be NO. The Canucks did not get the victory, not even close. There was this guy on the other team, named Teemu Selanne…that got 4 points….and lets just say that no matter his age, he has not lost a beat. All of you who thought Schneider was the answer…well he did not play his best, not even close. It amazes me that people were so quick to jump on the bandwagon for Cory, and as soon as he had a terrible game, they all began to jump off saying they all want LOU to stay. Maybe Cory will be able to rebound, maybe not, but in moments like last night, I appreciate that the team has two great goalies. Cory earned the chance to play in the season opener, and unfortunately he had a bad game. Both Cory & Lou are class acts, and both own when they have an off game, and both deserve better than the boos of bandwagon fans. You cannot win every game, but in a shortened season each win is that much more important in the standings. There were 13 games last night, 26 teams played, but only 13 could be victorious. The LA Kings, and Washington Capitals joined the Canucks in big losses [LA lost 5-2 on their banner night & Washington lost 6-3] in their opening games, but rest assured all three will be making a turnaround. I am not a bandwagon fan, nor will I ever be. 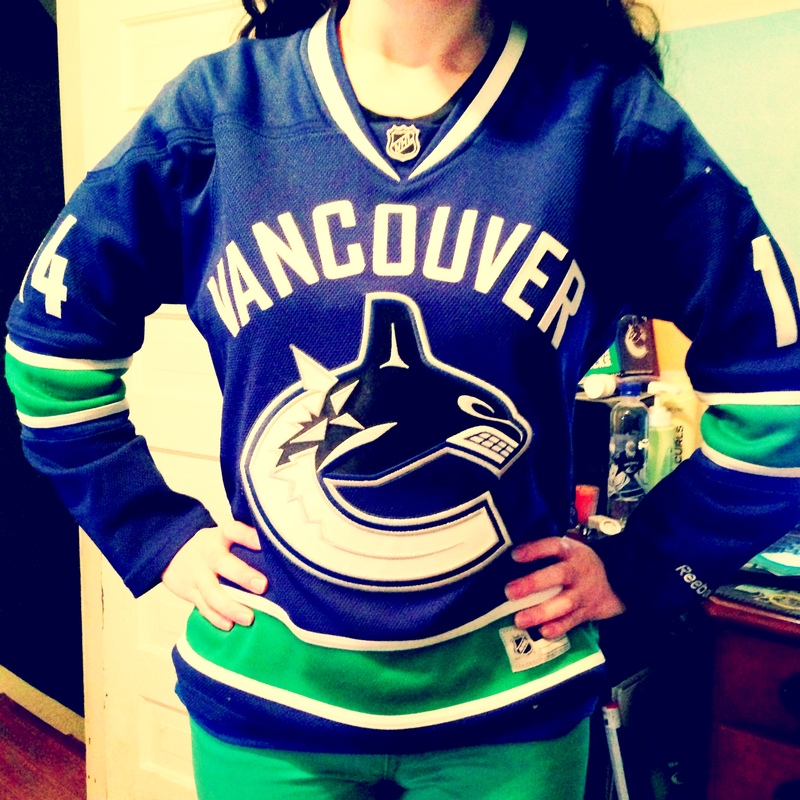 I am simply a Canucks fan through and through. Nuck said. The Canucks will get a clean slate today, as they face off against Edmonton tonight at 6PM [pacific time]. I will be watching the game, cheering louder with each goal they score. The Canucks may not have won their opening game, but they did have a few [yes just a few] great moments….such as the #Sedinery on display with Danny’s goal. I look forward to seeing more of those moments in the coming weeks [and perhaps one or two tonight]! Go Canucks Go! Win or lose, fans will continue to support their teams. This fan will ALWAYS support my team, no matter what crazy things the media or bandwagoners say. I am happy to report that I will be going to the game on Wednesday with my sisters! The Canucks play Calgary…it should be a great game! There is nothing quite like going to a live game…having 18,000+ fans cheering & yelling with you in unison. There are bound to be many many more headlines that will be revealed in the coming weeks as the season progresses. Time will tell as teams push to get into playoff form. Once again today is game day, and you know what that means! Shake off the negativity from yesterday and get ready for tonight’s game! Good luck boys! As always, until next time, nuck said. P.S. ALEX EDLER signed a 6-year extension with the Canucks late Friday January 18th. The contract has a $5 million cap hit per season [$30 million over all]. Edler definitely deserved this raise. This is a great deal for the Canucks as they could have lost him to the off-season market in July if they had not got this deal done. Edler probably could have gotten more money had he waited until July to see what other teams might offer him. This entry was posted in Hockey, NHL, Vancouver Canucks and tagged 2013 season opening, Alex Edler, Cory Schneider, hockey, NHL, Vancouver Canucks by sarahlaug. Bookmark the permalink.